For one reason or another, Atlanta has become a home for the puppetry arts; from the Center for Puppetry Arts to the ever growing Late Night Puppet Slam at DragonCon, it's a scene that continues to surprise me with its breadth and uniqueness. That's why it is particularly exciting to have a puppetry feature film play at this year's Atlanta Film Festival, and Yamasong: March of the Hollows does not disappoint. The film tells an epic tale; it begins with the narrator (Bruce Davison) explaining how he left his war-torn world through a portal to start a new one, creating a race of clockwork robots called "hollows" on the planet Yamasong. Over time, the leader of the hollows, Yari (Whoopi Goldberg), decided to become like her creator and make a new race herself by converting the planets living organisms into mechanical hollows for her army. For their hubris, the hollows were locked up in a prison moon, but Yari creates an innocent hollow named Nani (Abigail Breslin) who is able to bypass the prison's security. Nani escapes and becomes intertwined with a terrapin warrior named Shojun (Nathan Fillion) just before Yari herself escapes and war breaks out on the planet once again. One of the biggest pitfalls that fantasy films encounter is to create too much too fast, confusing the viewer rather than engaging them. Luckily for us, Yamasong creates a rich mythology without ever feeling overly complicated or difficult to connect with. That's not to say the world it establishes is simple; far from it. 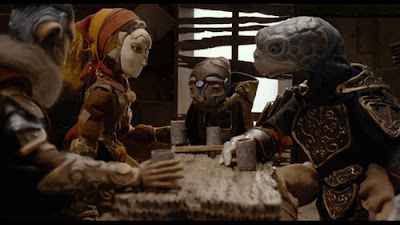 There are several interesting races, from the robotic hollows and warrior terrapins to goat-like creatures that live in the mountains and "tricksters," aliens that live on asteroids surrounding the planet. The world-building is impressive and at times quite exciting to dive into. The puppetry itself is splendid; the looks of all the different creatures is unique, each crafted with careful detail. Most surprising though is that the film succeeds at creating extended martial arts action scenes with puppets that work just perfectly. It's not just a punch here and a kick there–the fights are elegant and dynamic, full of flips, dodges, flying around on other creatures and generally making you forget you're watching puppets jump around. The Asian-inspired score adds a lot to the action, as does the admirably crafted sound design that never misses a beat. The story of March of the Hollows, a sequel to director Sam Koji Hale's short film Yamasong, is a fun and engaging one that rivals that of other standalone fantasy films and is reminiscent of Studio Ghibli films at times. The clear themes revolve around family as nearly every character is trying to relate to their father, mother, sibling, or child in one misguided way or another. Of course it's impossible not to mention the stellar voice cast of the film, which boasts great performances from Whoopi Goldberg, George Takei, Malcolm McDowell, Bruce Davison, Ed Asner, Peter Weller, and Freida Pinto in addition to its leads Abigail Breslin and Nathan Fillion. Their talent and variety in vocal style really brings the fantastic world of Yamasong to life. Despite its relatively short running time of 95 minutes, there are a few spots where it tends to run a little long; there are a fair amount of shots of characters looking around or thinking that just feel a bit prolonged that probably could have been cut a bit shorter. That's a minor quibble, however, and overall the film left a very positive impact. Given that Hale and co. have managed to create a mythology and arguably a new genre–Puppet Martial Arts Fantasy–I'll be very interested to see what he and his team move onto next! Yamasong: March of the Hollows had it's world premiere at the Atlanta Film Festival on Sunday, April 11th. You can find out more by visiting the film's official site or Facebook page.